There are always certain things that make places unique and that are filled with the magic of authenticity. They have the power to make people feel an intense connection to the essence of the area. To experience these things can feel like finding a missing piece we had been searching for ages. They can trigger a beautiful sensation of discovery within visitors and we locals miss them terribly while being away, because they give us a soothing familiar feeling. In this post, we have compiled and described a bit of what we believe makes this part of the world so special. These are some of our favorite genuine things to experience in Southernmost Spain. We strongly recommend to enjoy them at least once in your lifetime. This is our local idea of paradise. 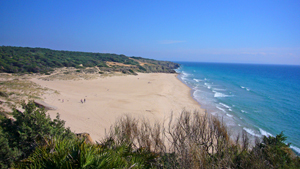 The province of Cadiz has kilometers of white sandy beaches and cool Atlantic waters that are a real gift from nature. The closer you get to the strait of Gibraltar, the better views of Africa you get. You look to the front and you see the beauty of the Atlantic ocean and Africa behind. You look back and you see nothing built by the humans. Swimming on these beaches feels like having your own bit of heaven and gives you an incredible dose of vitality. You can hear your body saying “thank you for that” while you lie on the warm sand right after a swim in the gorgeous beaches of Cadiz. Red tuna spends the winter in the north sea eating loads of herrings and getting fat, before its spring travels to the Mediterranean. Along their way, some shawls of Tuna are intercepted by a few barriers of handcrafted nets set along the coast of Cadiz and called Almadrabas. 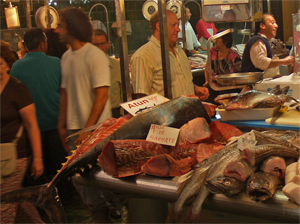 A few days later the local markets start to proudly show this delicious fish in their stalls. Also fish restaurants begin to happily announce that they have fresh tuna available. We believe that the experience of eating a grilled steak of fresh tuna makes you live longer, so this is a spring foodie treat that we consider a must. Once on the frontier between two kingdoms (one Muslim and one Christian), many quaint mountaintop villages of Southernmost Spain still keep proof of this in their names. Exploring any of these “de la Frontera” villages in the mountains will allow us to see evidence of the different cultures that populated Andalusia in the past, while offering us breath taking views and the most charming little corners. These villages have the power to make you feel welcome and inspired instantly and many people picture themselves living there one day. This festivity lasts for a good two weeks and attracts people from all over Spain. If you decide to make it to Cadiz Carnival, you’ll be expected to dress up and behave accordingly. This celebration is to do with being creative and sarcastic, so the most successful costume will be the one revealing the sharpest sense of humor. Cadiz will give you total freedom to act as your character of choice during its carnival. This generates interaction with many other characters and results in the most fun and surreal situations. You may start seeing thieves chasing policemen, flowers flirting with bumblebees or angels greeting demons, before finding Snow white with seven smurfs, or Mulder and Scully taking pictures of Batman making friends with the Joker. Tabancos are traditional Sherry bars original from the city of Jerez, where Sherry is often served straight from the casks. Some of them date from the nineteen twenties and thirties and they have a special local charm that is very difficult to find outside Jerez. Drinking Sherry in a tabanco is an delightful experience for wine lovers and also a trip through the history of the Sherry triangle region. These genuine bars have real character and it’s not only because of serving glasses of an ancient tradition but also because of the local and friendly atmosphere that sometimes results in improvised singing, guitar playing and dancing. This historical spot saw a spectacular naval battle in 1805 which gave its name to the most popular square in London. Nowadays Trafalgar cape is a gorgeous natural park with vast extensions of sleepy farmland, thick pine forests, long sandy beaches and stunning cliffs. Most of the coastline has a South West orientation which is ideal for watching the most beautiful sunsets over the sea. A zambomba is a traditional percussion instrument that is used to accompany the singing of Christmas carols. 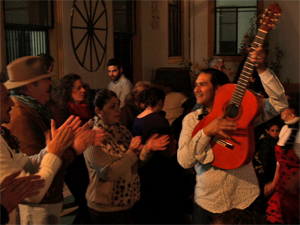 However, in Jerez, this very instrument has given its name to a unique local Christmas celebration, where people from the same neighborhood gather to sing and dance flamenco Christmas carols, drink sherry and eat sweets frequently around a fire. People of all ages participate together in this tradition that fills the streets and patios of Jerez during Christmas, turning the city into a charming food, wine and music festival for about three weeks. 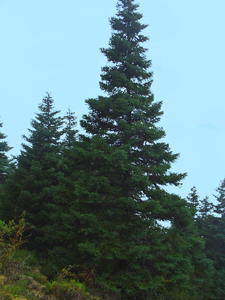 Pinsapos (Spanish firs) are our most beloved native trees. They are tall and elegant and they only grow in the mountains of certain areas of Southernmost Spain. They seem to be very sensitive to beauty too because they like to choose idyllic locations to form forests. Hillwalking through a pinsapar is a truly unique experience. 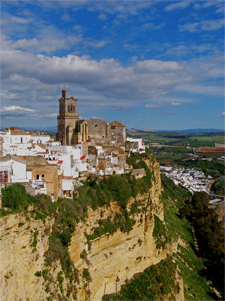 It allows one to see a very particular type of natural beauty that can only be found in this part of Andalusia. The Sherry towns (El Puerto de Santa María, Sanlúcar de Barrameda and Jerez de la Frontera) have still a few wineries where sherry can be bought by the litre straight from the casks. You just need to approach their rustic counters with a bottle and they will fill it in front of you by the litre. This is a common thing to do for many locals who are used to using sherry on a daily basis for cooking and drinking. The local bodega is one of the stops along their shopping route where they often meet relatives, neighbors or friends before heading to the next local shop. Designing your own local shopping route with its corresponding stop at the local bodega is a pleasant experience that always opens doors to meeting the wisest locals and to getting to know the best traditional recipes with Sherry. The light in the province of Cádiz has something magic. It has the power to keep people happy and healthy under the most vivid blue skies. Sailing across the bay is a glorious experience that allows to see the sunlight reflecting on a silver sea. The brightness then doubles filling us with joy and allowing us to be inspired by a beautiful series of historical towns, colorful beaches and lively natural parks that extends from Cadiz city to Rota. If you would like to enjoy the magic of these experiences, don’t hesitate to check our tours or contact us. We’d be delighted to share with you the wonders of Southernmost Spain. It is brilliant the post and the experiences that you propose. Congrats!!! Thank you Marta. We are very glad that you have enjoyed reading the post. I am a Tapia, and I read about an Andres Tapia that came to Mexico during the conquest. We saw Cadiz on the telenovela, La Reina del Sur. Then I started reading up on Cadiz. It is gorgeous there. We live in Kaua’i and love the sea. Please send my aloha to all Tapia and Perez that you know. Aloha and be proud of your lovely Cadiz.